EBook - "Transitioning from MILITARY to CIVILIAN Helicopter Flying"
“Transitioning from Military to Civilian Helicopter Flying” addresses many key issues facing military helicopter pilots when leaving the service to accept employment in the civilian helicopter industry. Whether retiring or departing prior to retirement, this ebook should cover most points a military pilot should consider. Bob Brewster is a highly experienced aviation professional with a diverse background in both military and civilian flight operations. He holds dual Air Transport Pilot (ATP) licenses for both airplane and helicopter and is a Certified Flight Instructor (<?xml:namespace prefix = st1 ns = "urn:schemas-microsoft-com:office:smarttags" />CFI) in both. His flight time exceeds 7,600 hours and is split between airplanes and helicopters. During his military career he flew over 700 hours of actual combat flight time while in Vietnam and held numerous flight operations officer positions with several active Army and Army National Guard combat units. As a civilian, he has flown both airplane and helicopters while filling positions as FAA Part 135 Check Airman, Chief Pilot and Director of Operations. 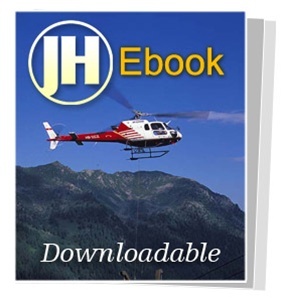 This ebook is for all interested in a job or career in the civilian helicopter industry and is orientated toward anyone in the military who is debating whether to leave or stay in the service. You are in the military wondering what it might be like to leave the service for a civilian flying job. Although you may also have fixed wing time, your primary background and career focus is primarily helicopters and your training has been the best ever given to a pilot. You have accumulated enough flight hours doing things with helicopters that were technically impossible to do 10 or even 5 years ago. This experience has made you very confident in your piloting capabilities. Some of your missions have been downright scary for you and your crew, while your aircraft……..
Another key point, while in the military you are expected to properly handle your equipment and aircraft in a manner that protects its integrity and service life. However, the military also understands that there are times when flight equipment and aircraft may be stressed beyond their tolerances due to the mission or the need to simply survive. This may lead to component or structural damage. However, because it is combat, or even training, the military is more tolerant of these costs as part of the price necessary to complete the mission. In the civil world, if you damage your aircraft,………..
Knowing the requirements of the Federal Aviation Regulations (FARs) must be your first big step. Complying with the FARs are mandatory, if you want to be legal when you are flying as Pilot-in-Command on any flight as a civilian. The primary FARs that you need to know are FAR Parts 61, 91 and 135…………..
After the completion of military initial flight training and the issuance of a military designated flight crewmember status as a pilot, you are eligible to take the Military Competency Helicopter (MCH) writtenexamination for either the private or commercial rating. This same exam is necessary if you leave the service and desire to obtain an original civil pilot certificate; however…………………………. The hiring process will vary from company to company and operator to operator, however, you should expect that a company or operator with a credible job opportunity to have the following steps in their hiring process. Complete an Application – even with a sparkling resume that can be electronically transmitted by email, fax or listed on line, you can still expect to complete a company application that must be filled out with pen in hand. There is some logical reasoning behind this step……………..
Major areas where civilian helicopter jobs are available ………….. There is a major difference in the attitude expected from a civilian pilot versus what you might have experienced in the military. It is always interesting to learn what FAA pilot examiners have to say about the people receiving licensing flight checks from them. The average helicopter pilot examiner deals for the most part with new students working themselves up the licensing ladder from Private, Commercial, CFI and Instrument. Occasionally they get the active commercial pilot adding an instrument ticket and they get the former military pilot going for his commercial, instrument and/or ATP. WHAT JOBS ARE BEST IF YOU ARE - SINGLE? MARRIED? LIKE TRAVELING? Unlike the military, you have a choice of where geographically you want to work and are even free to pick the company that will be your employer, if they are hiring. However, in today’s rapidly changing and competitive world, you may also have within a company the ability or need, depending on your perspective, for additional assignments away from home. In these decisions, it may be an important consideration if you have a family or dependents on whether you can accept these assignments or not. Many civilian companies are only regional in nature and working outside their region is not an option. These companies may not have the ambition to work in other areas or perhaps the expense associated with working away from their home base is prohibitive…………. In the aviation industry today an interesting phenomenon is happening regarding compensation for helicopter pilots. As a whole, helicopter pilots have historically always lagged behind or were paid considerably less than their airplane pilot counterparts and the ability to progress up through a structured compensation plan did not exist in helicopter operations, unless it was as part of a corporate flight department or a large operator. Starting with the Vietnam War in the 1960’s and 1970’s, the helicopter truly came into its own as a multi-purpose aviation tool for the military. As the Vietnam War wound down, civilian helicopter operators and corporations starting hiring former military pilots for new emerging helicopter operations and as this evolution for the helicopter continued its tremendous versatility would be demonstrated through a myriad of world disasters from floods, earthquakes, avalanches, tsunamis, fires, hurricanes with Katrina being the biggest natural disaster followed by fires in the West and Southeast. Today, the world is a much better place to live because of the helicopter and the many missions it can perform. Military pilots for the most part have already experienced this versatility, and on average, most civilians have yet to learn about. However, the use of military aircraft for a wide variety of non-military missions is working to expand civilian helicopter use as the public starts to gain a better understanding……………..